However council workers in Perth have caused hilarity with their wonky version of a sports pitch on the city's South Inch. He said: "Clearly something has gone wrong with putting these markings down. I have raised this with the director of the environment service and have been assured that the markings will be sorted very quickly. "To be honest laying pitch markings straight and accurately requires skill. You need to measure and stake out the pitch accurately and keep your eye focused on the end point. The slightest bumps and deformities can throw you out, it is dead easy to go off track. "I have some sympathy for whoever did the markings. It looks like they have tried to put them right but haven't greened out the mistakes yet. I tried to do pitch makings when I was at school and I remember the results looking like spaghetti. "We all learn from our mistakes and hopefully they'll make a better job in future." She said: "We are aware of this issue and the pitch lines will be correctly repainted this week. "We apologise for any inconvenience this may have caused to pitch users and have taken steps to ensure there is not a repeat. The markings relate to pitch provision for full-size, seven-a-side and five-a-side games." 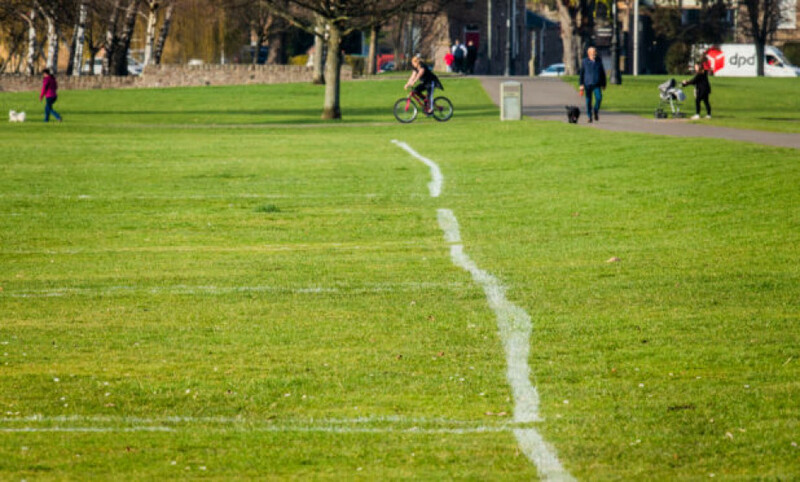 Pictures of the wonky line work were posted to social media, with one commentator writing "Blimey….he had some hangover", while another said: "the ball was on the line? Which one?"